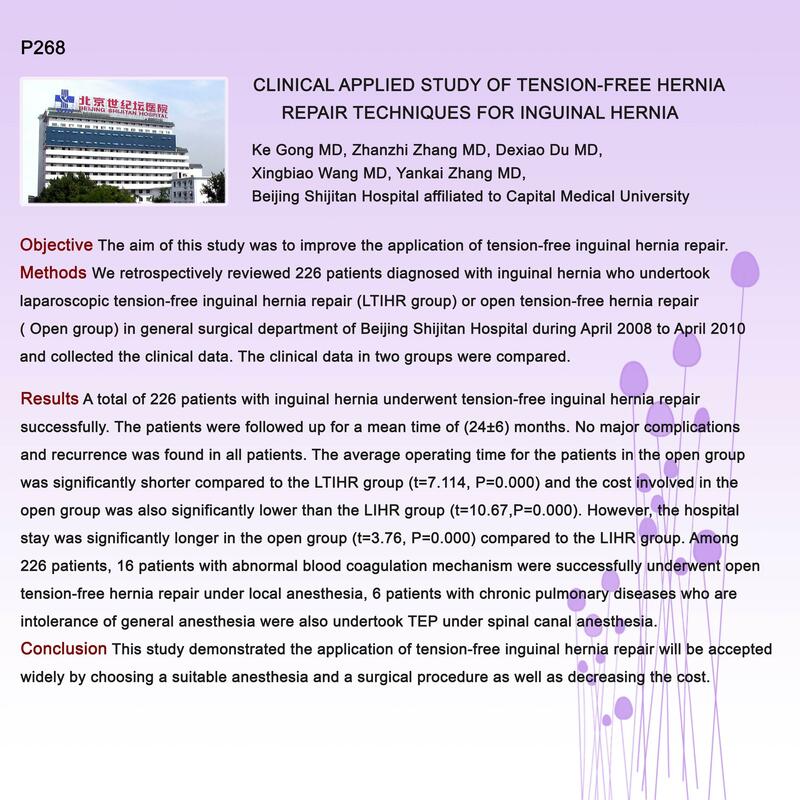 Objective The aim of this study was to improve the application of tension-free inguinal hernia repair . Methods We retrospectively reviewed 226 patients diagnosed with inguinal hernia who undertook laparoscopic tension-free inguinal hernia repair (LTIHR group)or open tension-free hernia repair ( Open group) in general surgical department of Beijing Shijitan Hospital during April 2008 to April 2010 and collected the clinical data. The clinical data in two groups were compared. Results A total of 226 patients with inguinal hernia underwent tension-free inguinal hernia repair successfully. The patients were followed up for a mean time of (24±6) months. No major complications and recurrence was found in all patients. The average operating time for the patients in the open group was significantly shorter compared to the LTIHR group (t=7.114,P=0.000) and the cost involved in the open group was also significantly lower than the LIHR group (t=10.67,P=0.000). However, the hospital stay was significantly longer in the open group (t=3.76,P=0.000) compared to the LIHR group. Among 226 patients, 16 patients with abnormal blood coagulation mechanism were successfully underwent open tension-free hernia repair under local anesthesia, 6 patients with chronic pulmonary diseases who are intolerance of general anesthesia were also undertook TEP under spinal canal anesthesia. Conclusion This study demonstrated the application of tension-free inguinal hernia repair will be accepted widely by choosing a suitable anesthesia and a surgical procedure as well as decreasing the cost.